Online Bill Payment is convenient, safe, and FREE! Through one user-friendly screen you can pay all your bills in a fraction of the time it takes to write checks and address envelopes. Your payments will typically post faster too. address or mobile number to move money from your bank account to theirs. 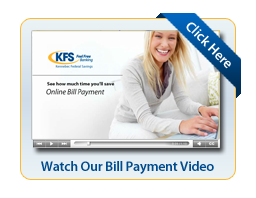 NOTE: A KFS checking account and Online Banking are required for Bill Payment service and Popmoney.